Special HOLIDAY VERSION of "Miracle on South Division Street" available. Same title, same story, same everything -- just reworked for the Holidays! For inquiries about scripts and performance rights please log on to www.playscripts.com. Fresh from its off-Broadway run at St. Luke's Theatre, “Miracle on South Division Street” is the story of the Nowak family, living amidst the urban rubble of Buffalo, NY’s East Side. Maybe the neighborhood is depressed, but not Clara, the family matriarch. She happily runs her soup kitchen and tends to the family heirloom – a twenty-foot shrine to the Blessed Mother which adjoins the house. 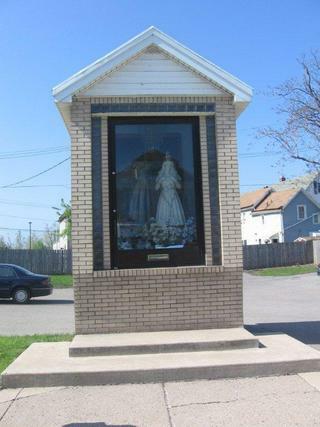 This neighborhood beacon of faith commemorates the day in 1942 when the Blessed Virgin Mary materialized in her father’s barber shop! When the play opens, a family meeting is in progress. Daughter Ruth divulges her plan to finally “go public” with the family miracle by creating a one-woman play about the sacred event. But during the course of the meeting, the entire family’s faith is shaken to the very core when a deathbed confession causes the family legend to unravel. The results are heartfelt and hilarious. "Best comedy of the year in Connecticut! A great hook that will keep generations laughing. You have to see it to believe it." A rollicking comedy where one revelation builds on another to an unexpected and thoroughly satisfying conclusion. Best to order tickets before it sells out." "Take my word for it, go see and enjoy 'Miracle on South Division Street.' Four Stars out of Four." "Utterly delightful while delivering a solid message on faith, the lack of it, why we believe what we believe, and how we can, or must, adjust to life's surprises." "A well-constructed and most endearing play. I loved it." "You will quickly fall in love with the characters." Relatives who are a little too close; a suffocating sense of limits; secrets that, once shared, undo the precepts that defined a way of life: If these sound like elements in a family's deconstruction - the stuff, say, of a Sam Shepard play - they certainly could be. But Tom Dudzick's "Miracle on South Division Street," at St. Luke's Theater, is a sprightly, gentle comedy, where revelations that might remake a family's sense of itself are each rolled out in service of laughter. "Miracle" concerns the Nowaks, rock-solid members of the Roman Catholic, Polish-American community on the East Side of Buffalo. They've been maintaining a shrine that Grandpa Nowak built in 1943, commemorating a vision - of the Virgin Mary preaching world peace - that he said he had shortly after arriving in town and opening his barbershop. Literally keeping the faith nearly 70 years later in the gritty, deteriorating neighborhood are his daughter, Clara (Peggy Cosgrave), and her grown children: Jimmy (Rusty Ross), a garbage collector, Bev (Liz Zazzi), a ketchup bottler, and Ruth (Andrea Maulella), who would be a struggling actress if she could only get a part. It's the shrine that has given the family its identity: "We were selected," Clara says firmly, even if the church won't recognize her father's account as a miracle. Clara long ago converted the barbershop into a kitchen for the poor, proudly offering soup "prepared on holy ground." If Jimmy is tired of telling passing strangers the story, hoping for contributions, Bev believes it fervently, and restricts her romances to those men who might believe it too. When Ruth gathers the family to ask permission to dramatize the shrine's history, they at first applaud, then are alarmed when she adds, "I mean the true story." Oh, really? Do tell. This production from the Penguin Rep Theater company (staged previously as "Our Lady of South Division Street") is nicely lived in. Joe Brancato directs the back-and-forth easily, and the kitchen set by Josh Iacovelli, with yellowed cabinets, faded wallpaper and an ancient refrigerator, has a stuck-in-the-'70s familiarity. The players are all very comfortable in their roles - Ms. Cosgrave gets the most laughs - though only Ms. Zazzi has the hard A of the Buffalo accent nailed. If the epilogue feels unnecessary and a bit out of character, its all's-well-that-ends-well spirit is in keeping with the sweetness that this comedy sustains throughout.